Learning Azure Local Storage with me. Azure has many different storages. If you start Azure fabric and look at Development Storage UI you can see Blob, Queue, and Table Storage. In addition to that Windows Azure also has SQL Azure. There’s also Local Storage and that is what I want to talk about. Local Storage is a temporary file system storage area. If you didn’t get from previous sentence, it’s a temporary storage. Local Storage also available to a single role instance and cannot be shared across multiple role instances. What does it mean for you? It means that you should not store any data that you want to be persistent for a long time. If you upgrade a role instance or your instance dies, you will never see the data in the Local Storage again. All important data you should store in Blob, Table Storage or SQL Azure. Advantage of Local Storage is that it’s faster than other storage mechanisms mentioned earlier. Blobs, Table Storage and SQL Azure are located on different servers than your Azure VM. Local Storage is on the same VM where the role instance is running, therefore you’re going to have less latency. I read somewhere that the maximum size of Local Storage is 20GB for a single role instance. However, when I tried to create a Local Storage of 100GB, I was successful. I think that now we have pretty good idea what Local Storage is. Let’s set up Local Storage. You can set up Local Storage by either modifying the definition file (.csdef) or by using GUI when modifying the role properties. Set up by modifying .csdef file. Let’s create a Local Storage named “lessonStorage” that is 20 MB. We can place multiple LocaStorage elements inside LocalResources. As you can see it’s not hard to create Local Storage by hand but it’s even easier to create it using GUI. Just right click on the role in your Azure project (it’s inside the Roles folder) and select Properties… or press Alt+Enter. In the properties window select Local Storage tab. The application executes RoleEnvironment.RequestRecycle() method. A catastrophic failure on the server. When you modify it by hand in definition file, you need to add cleanOnRoleRecycle attribute. How to use Local Storage? In code to get access to Local Storage we just need to use static GetLocalResource method that takes only one parameter a name of our Local Storage. Name The name of the local storage. We defined it in our definition file. In our case it’s “lessonStorage”. MaximumSizeInMegabytes The maximum size in megabytes allocated for the local storage. In our definition file we allocated 20 MB. RootPath The full directory path to the local storage. All of the properties above are read-only properties, we cannot set them at runtime. 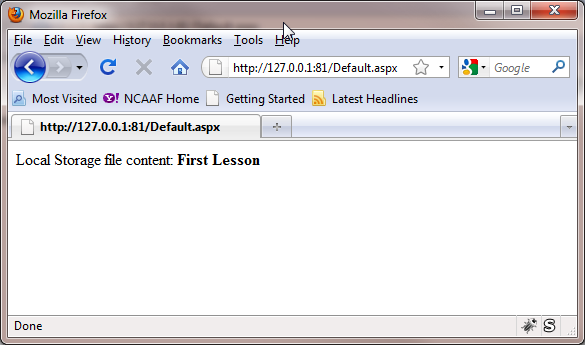 We are going to create Lesson.txt file that will contain only one line “First Lesson”. Than using Local Storage we will print content of that file in the browser. Next we are going to put code in Page_Load method to create Lesson.txt file and than display it’s content using Local Storage. In order to have access to RoleEnvironment we added using statement on line #4. I told you almost everything I know about Local Storage. If I missed anything or said something incorrect, please let me know so I can learn. Previous postWhy Azure Web Role by default runs in the Full Trust? Next postCropper free alternative to Snagit. BTW: the size of the local storage depends on the VM size you purchase. Thanks for the quick and simple example! I was wondering if there are any pitfalls (or things to stay away from) while using local storage. Any idea? Can I effectively upload thousands of files to a local storage . my web role depend on thousands of data files, which need freqeuently read these files. I think the local storage is good in performance, but how can I upload all these file to the local storage. I mean could I access the VM using FTP ? Accessing blobs is an expensive operation (in terms of time) because they can be in a machine far away from the one actualy executing your code. So, if your application needs to do a lot of reading operations, it is recommended that you download the blobs to local storage (which is the hard drive in the machine where your code is running) only once. From there you can access the files using standard System.IO classes and methods. In my web roles, I usualy download the blobs I need when the application starts. Can you please provide an example of how to download the blob to the machine running your code? How much time did it require you to write “Learning Azure Local Storage with me. Oh my goodness! Awesome article dude! Thanks, However I am encountering difficulties with your RSS. I don’t understand why I am unable to subscribe to it. Is there anybody else having identical RSS issues? Anybody who knows the answer will you kindly respond? Thanks!! Thanks a lot! It’s very clear article. Pingback: » How to access files from within a cloud web service?